September 25, 2018, 5:00 p.m.
Government healthcare, gun control, and illegal immigration citizenship are the top issues among Hispanics living in the US, according to data from YouGov Plan & Track. Respondents are asked about a variety of topics and issues, and then asked to rate how important particular issues are to them. 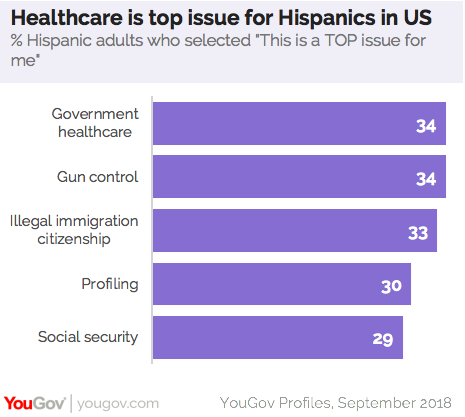 More than one-third (34%) of Hispanics say that government healthcare is a top issue for them, while an equal number (34%) say that gun control is a top issue for them. Over half (56%) of Hispanics say they would “strongly support” this idea, while only 43% of the general population agreed. The total population overall was almost twice as likely (13%) as Hispanics (7%) to “strongly oppose” giving illegal immigrants a path to citizenship. Other top issues among Hispanics include police profiling (30%) and social security (29%). For profiling, people are asked “Do you think it’s okay for law enforcement to decide to stop or search people partly on the basis of their race?” Over half (56%) of Hispanics and 58% of the total population say “No, definitely not.” For the topic of social security, people are asked “Do you think social security is fine the way it is, is in need of reform, or should be done away with completely?” One-third (33%) of the total population, and 31% of Hispanics say that it’s in need of major reform.